Microsoft: Free Office 365 ProPlus for your Students !!! 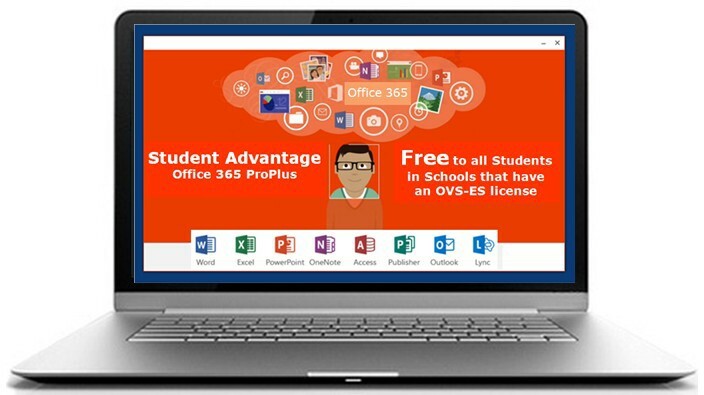 Starting from 1st December 2013, Microsoft, through its Student Advantage program, will give students Office 365 ProPlus for FREE, provided their school has purchased an OVS-ES license. Office 365 ProPlus is the latest version of Office that includes:- Word, Excel, PowerPoint, Outlook, OneNote, Publisher, Lync and Access. Each subscription license allows each student to run Office on up to five machines and/or mobile devices;- being PC or MAC, Android, iPhone and Windows Phone. OVS-ES is a Microsoft scheme for schools and colleges that allows Office 365 to be installed for teachers and students and the preferential pricing is based on the number of full time and part time staff. e.g. if there are 26 Full Time and Part Time teachers in a school, then 26 licences are bought, regardless of how many laptops, computers etc. are present in the school. This is fantastic news as it will mean significant savings for Schools and Students and will allow schools to spend their funds on other needs. Students can use Office 365 on up to 5 devices that can be used at home or anywhere. Homework and projects will be easier to complete, store and share with fellow students and teachers. Students will become more independent and more organised. Students will develop necessary IT and relevant skills that will help them in later life in the workforce. Thank you and we will respond to you shortly. We can also look at your current Microsoft Licensing and make you aware of the savings to your school should you avail of one of the Microsoft Site Licensing Offers.